This year the 7th graders in ISTP's International Middle School have been working on a unique project that combines design thinking, computer science, and collaboration with their younger schoolmates. Science teacher Elisabeth Lepert gave them the task of creating and coding an educational computer game for either 2nd or 4th grade students that would teach relevant mathematical concepts. She instructed students to take a design thinking approach to the project, a process aimed at solving a problem based on inspiration, empathy, feedback, and iterative improvement. Step 1: Investigate – To begin, the 7th graders interviewed the 2nd and 4th grade teachers to see what math concepts they wanted their students to review. They studied the relevant elementary curriculum to be sure their games aligned with what was being taught in class. They also interviewed the 2nd and 4th graders themselves, asking what games they like and how they think they learn best. 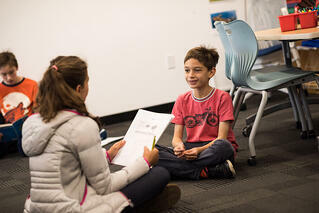 Step 2: Develop an Idea – Students brainstormed and outlined different possibilities for their games based on what they learned through their interviews and research. Step 3: Create a Prototype – The 7th graders built their computer games using the Scratch programming language, which they were already familiar with from previous computer science classes. Step 4: Test and Get Feedback – Students revisited the elementary students they had previously interviewed, had them play their prototype games, observed their play, and took their feedback. Step 5: Improve –The 7th graders enhanced their games based on the feedback they received from the elementary students. Step 6: Repeat – The final step in the design thinking process is to repeat the steps starting from the beginning until both you and your user are satisfied with the design. Be sure to check out the short video above to see the design thinking process in action during this project!